This box is crafted from apple tree. 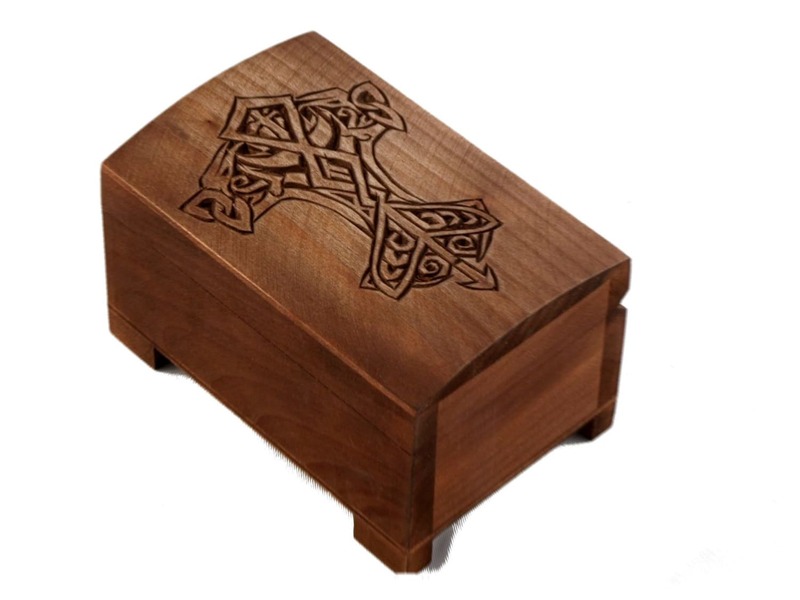 The lid has hand carved viking pattern - hammer of Thor. IX century replica. checking out, which take you out of Etsy and into PayPal where you must complete your order. When will your package arrive? We do not guarantee the arrival date of any order. In general, your items should arrive in around 2 weeks' time however sometime it may take longer depending on your area, postal service provider, custom clearance, festive seasons etc especially International buyer. We will convoy you the details of your item(s) once it has been sent. If you are planning for a holiday or special day, please do your best to order in a timely manner and let us know so we can try our best to accommodate. Expedited Shipping: We can do expedited shipping, but please convoy us before purchase so that we can make a special listing for you to reflect the expedited shipping price. We have no problem cancelling and refunding an order as long as it has not been shipped. If the item has been shipped, then it needs to be returned to us before we make a refund. We usually do our best to represent our items as they are -- If you are not sure about something, please ask before you make a purchase. you can return it to us for a refund. But please bear in mind - only when we receive the item in good condition (un-used, clean & sellable), then we will make a refund after deducting the respective shipping fees. Please! Please! Please! DO NOT RETURN the item if it is no longer in good condition as we will reject your refund request. As we hope to develop long term relationship, we do our best to help you and hope you enjoy your purchase with us. Once we place the item in the mail it becomes the responsibility of the postal service provider. that the color & item will be accurately displayed by your monitor. Custom inquiries are always very welcome! And should you have any questions or comments about a particular item or any of our policies please don't hesitate to convo us. Thanks for looking & have a great shopping! 1. The online store available at tabernavagantis.com is run by Freya Dorota Talik, Mysłowicka 26/2 street, 81-550 Gdynia, phone number: +48 501 945 741, e-mail address: Taberna.vagantis [!at] gmail.com, REGON no: 220825983, registered in Central Register and Information on Business kept by the Minister of Economy. 2. These regulations shall apply to all agreements concluded via tabernavagantis.com webpage. 20. Attachment no. 2 – document, attached to these regulations, which enables placing the order via mail. 24.	contact between the Buyer and the Seller in order to agree on the details of order realization, or in certain situations Project realization being a subject-matter of the order. 25. Prior to completing the order form or registration form along with creation of the account, the Buyer is asked to familiarize himself/herself with the content of the regulations and their acceptance. 26. The Buyer shall obtain the access to the account via login and password. Agreement concerning the keeping the account in the online store is made for the unspecified period of time and shall not entail any financial obligations for the Buyer. The agreement may be terminated in any moment by termination of the account in the online store or by sending the information on resignation by the Buyer to the following Seller’s email address: tabernavagantis [!at] gmail.com. 27. The online store organizes the promotions for chosen Special Products. The Seller lays down the rules concerning the promotions and makes them publicly available on the website of the online store. 28. Publications, advertisements, pricelists and other information on the Special Products found on this website, particularly their descriptions, technical parameters, application parameters and prices shall be treated as an invitation to conclude the agreement in accordance with the Article 71 of the Act of 23 April 1964 – Civil Code (Journal of Laws of 2014, item 121 with further amendments). 29. The conditions of the hereby regulations do not aim to exclude or limit any rights of the Buyer who is a consumer in accordance with the Civil Code regulations of 23 April 1964 (Journal of Laws of 2014, item 121 with further amendments), granted by mandatory provisions of law. If case of any discrepancies, the mandatory regulations take the precedence to the hereby regulations. 1. The Buyer is obliged to use the online store in accordance with the law in force, principles of community life and decorum, respect the personal and ownership rights of the third parties. 6.	place the order via email. 7. All the Special Products available in the online store are original, brand-new (free from defects) and in accordance with the applicable standards and requirements. 8. Assortment of the online store tabernavagantis.com consists of various appliances for historical reconstruction of the Early and the Late Middle Ages made for individual order. 1. The orders referred to in 3 a), b) and c) of this paragraph may be placed 24/7. 2. The Buyer is obliged to fill in the registration form and thereby open the account to place the order referred to in 3 a) of this paragraph in a proper way. 8. The Buyer is obliged to add the Product to the cart, fill in the order form available on the website of the online store and send it to the online store to place the order referred to in 3 b) of this paragraph and execute it in a proper way. 9. The Buyer is obliged to send the filled form (attachment no. 2) to the email address taberna.vagantis [!at] gmail.com to place the order referred to in 3 c) of this paragraph and execute it in a proper way. 10. Orders referred to in 3 a), b) and c) of this paragraph are processed from Monday to Friday from 9 am till 5 pm. 11. Orders placed on weekdays after 5 pm, on Saturdays, Sundays and public holidays will be processed the next business day. 12. Each order having as its object the Special Product is executed according to the rules laid down separately with the Buyer – taking into account the Buyer’s individual needs. The above refers mainly to the Products’ adjustments and delivery terms of the orders. 13. In case of the Special Products available on request, the Seller may request the Buyer to make the prepayment in the amount of 50 % of the whole value of the ordered Special Product prior to processing the order. 14. In case of orders having as their object the Special Products or when the Project is prepared as a part of the order – the Buyer shall accept the conditions of order performance and the Project as well. After that, the Seller shall send the final version of individual Project to the email address given by the Buyer during its registration. In case of no acceptance, the process of order performance will not start. 15. The Buyer shall accept the Project referred to in point 14 of this paragraph in the form of an explicit written declaration stating that the Buyer accepts the version of the Project presented by the Seller. The statement shall be made within 7 days from the receipt of the email message referred to in point 14 of this paragraph. 16. The Seller shall send the confirmation of order placement and the acceptance of the order for completion to the Buyer by email. 17. The sales agreement will be concluded at the moment of receipt the email message referred to in point 16 of this paragraph. 18. No changes in orders having as their object the Special Product or the Project are allowed after the order performance is initiated unless such a possibility has been foreseen by both the Seller and the Buyer while laying down the rules of order performance or the Seller accepts the change. 19. Order having as its object the Special Product may be canceled by the Buyer who is a customer within the meaning of the provisions of the Act of 23 April 1964 – Civil Code (Journal of Laws of 2014, item 121 with further amendments) only up to the moment of receipt of a message referred to in point 16 of this paragraph. 20. The order performance (preparation of the order and preparation for the shipment) is depends of availability of the product and it`s described on the product page weeks. Yet, in case of the Special Products ordered on special request the time of order realization is agreed individually with the Buyer. This consultation time devoted to discuss the details between the Buyer and the Seller concerning the Special Product or the Project shall not be counted as time of order performance. 21. The Buyer shall be informed about non-availability of the Special Products. Hence, the Buyer may agree on an extended time of order realization, resign from the Special Product ordered or resign from the whole order. In case of non-availability of the Products, the estimated time of order realization is agreed individually with the Buyer and the average time is 2 weeks. 22. The Seller reserves the right to cancel the order if the Buyer has not provided the Seller with missing items necessary for the proper fulfillment of order, despite the Seller’s notification, within 7 days from the notification. 1. Prices given in the store are gross prices expressed in EUR and they include VAT but exclude customs duties. Prices do not include the costs of delivery which are calculated during the order placement. 2. Buyer shall be notified on each occasion about the whole value of the order before the order is placed. 3. Proof of purchase (VAT invoice) is attached to each order. 4. In the event that the Buyer not being a consumer within the meaning of the provisions of the Act of 23 April 1964 – Civil Code (Journal of Laws of 2014, item 121 with further amendments) for the purpose of order realization, the Seller is hereby authorized to issue VAT invoice without the receiver’s signature. 9. The Buyer shall choose the payment method while placing the order. 10. If the Buyer chooses to pay as stated in 5 b) of this paragraph, the Special Products are dispatched after booking 100 % of the order value into the Seller’s account. 11. If the Buyer chooses to pay as stated in 5 c) of this paragraph, the Special Products are dispatched after the positive authorization of 100 % of order value. 12. If the Buyer chooses to pay as stated in 5 b), c) and d) of this paragraph and does not pay within 7 days from the date of order confirmation, the Seller shall request the Buyer to make the payment. If a request proves fruitless, the Seller has a right to cancel the order and inform the Buyer about it by email or by phone. 4.	delivery of the Products by Poczta Polska mail service to the Buyer’s address given while placing the order. 5. The Buyer shall choose the way of delivery while placing the order. 6. The Buyer shall cover the costs of delivery. 7. The Seller undertakes to provide the Buyer with the Special Products free from defects. 8. The Buyer undertakes to collect the Special Product shipped. 1. The Seller recommends to check the content of the parcel in a presence of courier or Poczta Polska employee. Not checking does not exclude the possibility of a claim. However, the act of checking the parcel accelerates the claim process. 2. The above shall not apply to an entrepreneur within the meaning of Article 43 (1) of the Act of 23 April 1964 – Civil Code (Journal of Laws of 2014, item 121 with further amendments) who is obliged to check the parcel in the presence of courier or Poczta Polska employee. 3. If it is stated that the Special Product is defective, the Buyer shall inform the Seller about that. 4. The claim shall include the Buyer’s data, description of the fault of the Product, information when the fault occurred and the Buyer’s demand. In order to smooth the claim process, the Seller makes the Attachment no. 1 available on the website. 5. The receipt or its copy shall be attached to the claimed Special Product. 6. The Buyer shall send the claimed Special Product back. or by sending an mail to: Taberna.vagantis [!at] gmail.com. 1. If any information or data is missing in the claim, prior to considering the claim the Seller shall request the person who lodged the claim to complete the missing data in a given scope. 2. The Seller undertakes to reply to the claim submitted by the Buyer within 14 days. Lack of response on the Seller’s side after this time, results in a complaint found justified. 3. Insignificant differences resulting from individual settings of the Buyer’s computer – particularly settings of the screen – shall not be the basis for any claim of the Special Product purchased. 1. All goods offered in the online store are under warranty granted by the manufacturer. 2. Details of guarantee procedure may be found on the guarantee card attached to the Special Product. 3. The warranty does not exclude, limit or suspend the Buyer rights on grounds of the Seller’s liability for physical and legal defects of the Special Product in compliance with the Act of 23 April 1964 – Civil Code (Journal of Laws of 2014, item 121 with further amendments). 5. In conjunction with section § 7. point 2 c), entitlement referred to in point 1 of this paragraph does not refer to orders whose subject matter are the Special Products. 6. The provisions of this paragraph shall not be applied to the Buyers who are not consumers within the meaning of the Article 22(1) of the Act of 23 April 1964 – Civil Code (Journal of Laws of 2014, item 121 with further amendments) i.e. persons making the legal actions related to their profession or business activity – in this event the right to withdraw from the sales agreement is excluded. 1. The Buyer, while filling the order form or registration form and starting the account, is requested to agree on processing his/her personal data by the Seller pursuant to the Act on Protection of Personal Data of 29 August 1997 (Journal of Law, no. 133, item 883). 2. The Seller shall process the personal data only in order to provide the services referred to in point 4 in § 1 of hereby regulations. 3. The personal data of the Buyer shall not be revealed to the third parties or institution for marketing purposes without the Buyer’s prior express consent. 4. The Buyer has a right to access his/her personal data for the purpose of verification, modification or removal from the Seller’s data base. 1. All the pictures of sample Special Products and other materials (including texts, graphics, logotypes) published at tabernavagantis.com are owned by the Seller or have been used with consent of third parties who are holders of copyrights. 2. Prohibited is the copying of the pictures, other graphic materials and reprinting of texts published at tabernavagantis.com including making them available online without the Seller’s written consent or the third party who is holder of copyrights. 3. Prohibited is also downloading pictures from the tabernavagantis.com website for marketing and commercial purposes. 4. Use of the above mentioned materials without the Seller’s written consent or other third parties who are holders of copyrights is unlawful and may give rise to civil or criminal proceedings against those who violate the law. 1. The Seller reserves the right to impose limitations in online store services due to technical service, repair works or improvement works. At the same time, the Seller undertakes all the reasonable endeavors to make sure that all the above mentioned works are done at night and last as short as possible. 2. The Seller reserves the right to change the regulations. The changes enter into force at a time specified by the Seller, however not earlier than 7 days from their announcement. Orders placed before the aforementioned changes will be fulfilled in accordance with the arrangements valid in the moment of order placement. 3. Any disputes between the sides shall be resolved by conciliation. However, in the absence of amicable settlement, the competent court for any disputes is the court competent for the Seller’s headquarters. 4. This regulation shall not apply to consumers within the meaning of the provisions of the Act of 23 April 1964 – Civil Code (Journal of Laws of 2014, item 121 with further amendments) where all the disputes shall be settled amicably or in the presence of independent and impartial mediator. In the event that no amicable resolution is reached, even through mediation, jurisdiction of the court shall be determined according to the rules generally applicable in the Republic of Poland. 5. Any matters not regulated by the hereby regulations will be regulated by adequate Polish provisions, particularly the Acts of 23 April 1964 – Civil Code (Journal of Laws of 2014, item 121 with further amendments) and the Acts of 30 May 2014 on Consumer Rights (Journal of Laws of 2014, item 827) and others. 6. These regulations come into force on 28 April 2016. Sent out ASAP during the holiday season. Great quality craftsmanship and detail!